Therapeutic gardener Ruth Nicholls provides proof positive of the benefits of gardening at large homelessness scheme The Victoria Project in Cambridge. A group of residents at the scheme, led by Ruth, began revamping the outdoor space at The Victoria Project in February. The burgeoning garden now includes vegetable plots with herbs, peas, pumpkins, and potatoes, as well as a wildflower area and a large insect hotel. Each section has flourished, and residents benefit from the time spent outside and fresh vegetables for their own meals. Ruth wrote on her blog: “The incredible insect hotel became a labour of love for the residents. One woman who helped to build it was in tears of joy as it was finally finished.” The keen gardeners will also take part in an upcoming Pumpkin Festival, holding a stall with the Cambridge Cyrenians. The success of the project reveals itself in many different ways. Simply being outdoors regularly can help bring emotional stability, improve self-esteem, reduce social isolation, and teach new skills. For many, it can be a gateway to paid employment, which in turn has its own benefits. “A few leave when they find work; one went on to a job as a gardener. For some people it’s a stepping stone, for others it’s just therapy,” Ruth explains. With more funding, the project could expand to benefit several homelessness schemes in the area, helping more than 100 people. There is a growing body of research that suggests gardening is good for both physical and mental health, with a recent King’s Fund report showing that it can significantly reduce depression and anxiety. The physical benefits are pretty obvious, but even gentle gardening has an impact. It could improve balance, thus helping reduce falls. Increasing people’s exposure to, and use of, green spaces has also been linked to long-term reductions in overall reported health problems. “I had been living a normal life: I was in a relationship, and had a job as a carer. I never thought I would ever become homeless. “I had to leave my relationship because my partner had become abusive. It had not progressed to physical violence, but I was not prepared to wait for that to happen. I left, with nothing. “I was referred by the single homeless service nearly a year ago to The Springs, a homeless service in Cambridge. I was really anxious when I first came, and had such negative expectations. “Shortly after I moved in, I was diagnosed with two prolapsed discs in my back, plus fibromyalgia, which results in chronic pain. I lost my job because of my condition and spiralled into a really low place. Not only had I lost my home, but my job, my identity, and my sense of self-worth. Everything I knew had gone and I had no sense of direction. I was angry and frustrated all the time. “When the garden project started, it was a new lease of life for me. I’ve been to nearly every session. I can’t do any of the heavy stuff, but I rake, sow seeds, make seed pots, and can manage a lot of things at my own pace. I can literally feel the old me coming back. Going out in the garden, being part of a team, makes me feel I belong to something worthwhile. I actually feel like I have a future. I have hopes and dreams again, when before I didn’t feel anything would ever change for me. “When I’m working out there I can concentrate without being distracted by troubling things, and when my thoughts wander, my responses are more positive. I am so much more confident, and feel I can deal with anything that life throws at me – even my family! “My GP told me recently that my fibromyalgia is getting worse. I know that life is never perfect and there will always be things that surprise you, but now I can deal with them, without feeling like giving up. 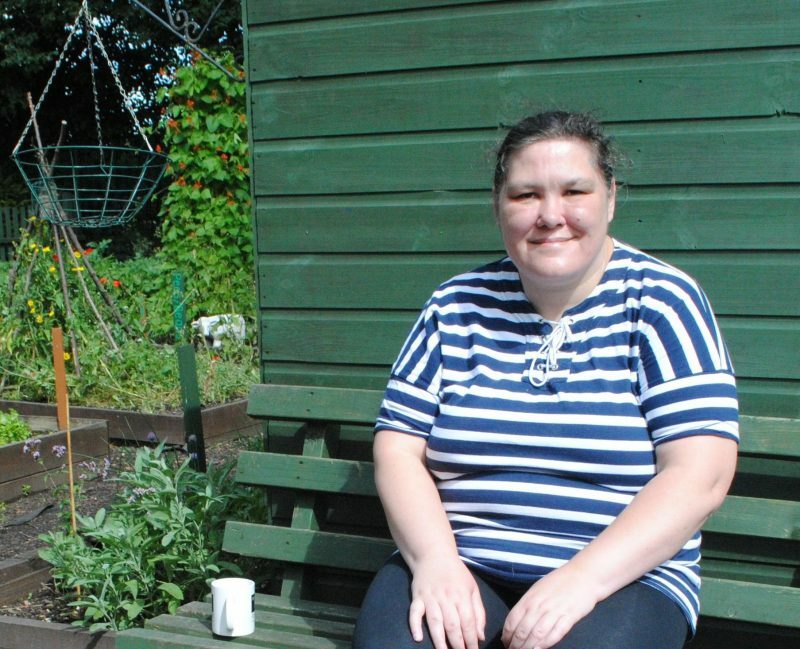 “The confidence that being part of the garden project has given me has made me grow in other areas too. I am now the resident representative, and am becoming more involved in how the service operates. It has made me more self-assured, and will be great on my CV!